The Super Bowl is usually in a sunny locale, but that doesn’t mean you have to miss out on the pigskin fun just because you live in a snowy climate. Find an open place to play — a backyard or nearby park will do. With some spray bottles filled with a water and food coloring mixture, mark out a large rectangular area to serve as the playing field. The teams line up at opposite ends of the field for the kickoff. When someone on the receiving team catches the ball, they try to advance across the other team’s goal line by running with it or passing it to a teammate. Play stops if the player is tagged by an opponent or slides out of bounds. The play then resumes on the spot. Each team gets four tries to score a touchdown or the ball goes to the other team. 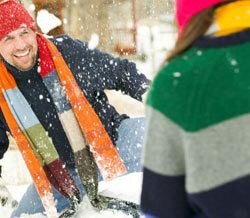 *Send us a picture of you next to your giant snowball, and we’ll make it worth your while! Sign up to receive our free newsletter to get regular reminders and tips for stressing less and having more fun. Consider it a well-deserved jolt of happiness for your inbox. We do that football game!! It slows it down quite a bit with deep snow (which works in my favor!). And hey, we have a warm up going on…a good time for making snowballs! Nice. Yes, it would seem that deep snow is the great equalizer. It’s like a team full of offensive linemen going out to try and catch a pass! So being an Aussie, there’s not much call for snowball fights here but I can attest to playing cricket in the snow when we lived in Banff, Canada. It was great fun until we lost the ball in a snow bank! I’ve never played cricket before, but imagine it’s quite a blast in the snow! Here’s a list of 3 unusual things to do when it’s 70 degrees outside in January. Get dirty in the garden. Take a walk in the rain. Can’t send a giant snowball picture. But, my kids have become giant mudballs as of late. 70 degrees in January…who’s rubbing it in now? By the way, nice food fight. Those are fun ANY time of year.